If you just want to get out and run, here are some popular running venues, click on the names to link to a map. Memorial Park: The most popular running location in Houston. The park is bounded on the north by I-10, south by Memorial Drive, on the west by Loop 610, and on the east by Wescott and Crestwood Drives. Seymour Lieberman Trail: The most heavily used running pathway in the city. It is a 2.9 mile loop consisting of crushed granite (no bikes allowed). Memorial Park Trails: For serious trail runners. The trails are color coded with maps at the trailhead signs. Trail options and one run variation are visible on the (linked) map. Located on the southwest side of Memorial Park. The trails are affected by weather and are closed if conditions warrant to preserve the trails. Call the Trail Line Hotline at 713-863-8403 extension 9 for trail openings and closures. BCRR 10-12 Miler: There are many options to start in the park, run in adjacent neighborhoods, and return. HARRA club, Bayou City Road Runners, typically run a variant this route for their Sunday morning run. Memorial Park / Allen Parkway 10+ Miler: This remains a very popular route with variations on both sides of Buffalo Bayou. The narrow sidewalk between Memorial Park and Shepard Dr should be traversed with care given the bikes, pedestrians and car crossings. Rice Loop: The ~3 mile crushed granite loop around Rice University is a perfect place to run if you're near the Medical Center. Rice is located East of Greenbriar Dr. & Rice Village, North & West of Main Street & the Medical Center, and West of the Museum district and Hermann Park. Buffalo Bayou Park Sandy Reed Memorial Trail: Ten-foot wide concrete trail located on both sides of the bayou accommodates cyclists, walkers and joggers. The five-foot wide asphalt Kinder Footpath, located along the bayou’s banks, is designed to accommodate park visitors who want to enjoy a walk or jog. Stretches from Shepherd Drive to Sabine Street between Allen Parkway and Memorial Drive. Terry Hershey Park: A popular place to run for folks West of the 610 Loop in Houston. This path follows Buffalo Bayou from the Sam Houston Tollway to Highway 6 and eventually to I-10. Lots of rolling hills. The trail is located East of Highway 6 at George Bush Park and West of the West Belt. Seabrook Trails / Kemah Bridge: The soft running trails in Seabrook and the nearby Bridge are the go to training spot for HARRA's Bay Area Running Club and all runners in the Clear Lake area. The Woodlands: More than 200 miles of hike and bike trails exist throughout the community that George Mitchell had a vision for and subsequently developed. Members of HARRA's The Woodlands Running Club, Woodlands Fit and Volte Endurance Training frequent many of these each and every week. 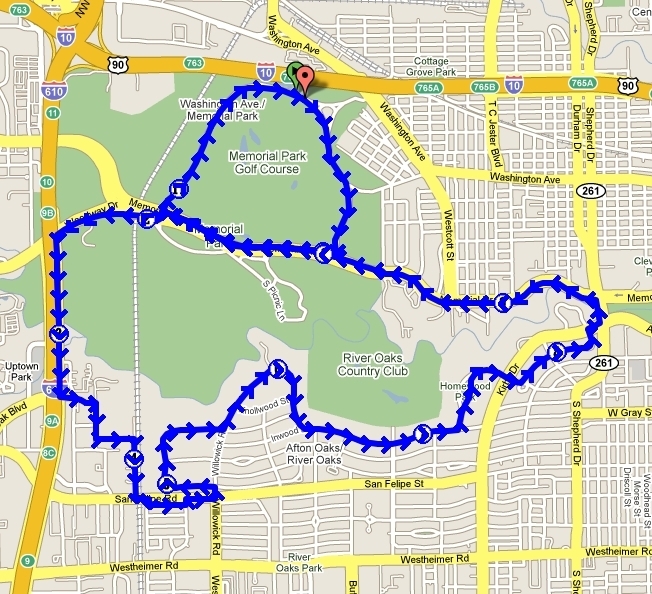 One runner, Liz Berry, has mapped these trails in to 58 unique segments and can be found at The Woodlands Trail Collectors.